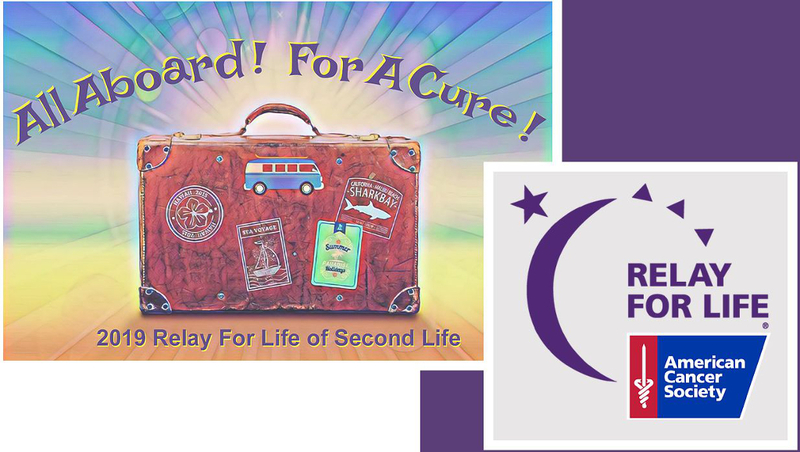 With the year drawing to a close, so to do the 2018 fund-raising efforts for the American Cancer Society (ACS) through Relay for Life of Second Life (RFL). As I write this, the annual Xmas Expo has closed, having raised US $20,495 in just 10 days. Currently, the RFL of SL SciFi Mini Expo is running, having opened its doors on December 14th – more on that below. One of the criticisms of RFL of SL / ACS is that it is “US centric”, a claim that isn’t entirely accurate. ACS works on a global basis in cancer treatment and care, and for 2018, this has been demonstrated through RFL of SL adopting the Kenyatta National Hospital Hope Hostel, Kenya, part of the ACS’s initiative to expand its Hope Lodge project around the world, providing free accommodation for cancer patients and their caregivers during treatment, who might not otherwise be able to receive treatment away from home due to difficulties in meeting the costs of accommodation, etc. The Kenyatta National Hospital Hope Hostel project represents the first international expansion of the Hope Lodge project because cancer is a leading cause of death within Kenya, where death rates from the disease among the populace have remained almost unchanged in 30 years. For 2018, the project was adopted by Fantasy Faire, which raised US $48,019 for the project. Further support for KNH will be provided via the proceeds from the Xmas Expo, some / all of which will be put towards funding two Patient Navigators to work with the more than 1500 cancer patients at the Kenyatta National Hospital in Nairobi. You can read more about the KNH Hope Hostel here, and about the ACS Patient Navigation programme here. Also in 2018, RFL of SL saw a broadening of the Making Strides Against Breast Cancer season, while the RFL of SL team also took a hard look at how to better position itself for fund-raising and community engagement in 2019 and beyond. The latter included outlining a new volunteer structure, and planned adjustments to the RFL season within Second Life. As with all things however, there are inevitable bumps in the road that can result in things having to change somewhat. And such is the case with RFL of SL. 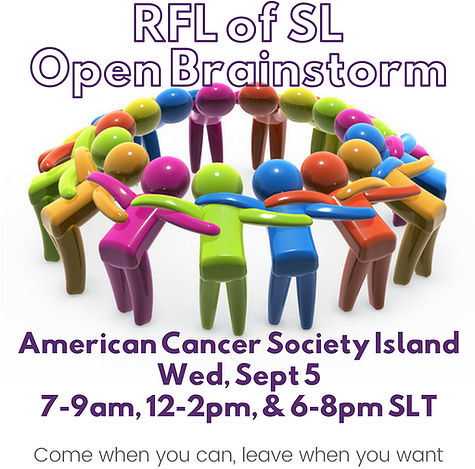 This does not mean that the American Cancer Society has chosen to end its presence in Second Life, but it does mean that our new vision for the future will need to be adjusted. While I fully expect that the American Cancer Society will assign a new staff partner to work with our volunteers in Second Life, this kind of transition will be easiest if we all focus on the essential tasks to provide quality cancer patient/survivor/caregiver support and Relay For Life/Making Strides Against Breast Cancer events. Our ACS support outreach and advocacy team of Nikki Mathieson, Trager Alter, and MamaP Alter will continue to advocate for and support our Season Team and our 24-Hour Team. The ACS support outreach and advocacy team of Nikki Mathieson, Trager Alter, and MamaP Alter will continue to advocate for and support the Season Team and 24-Hour Team. The Leads for the Season Team and the 24-Hour Team will continue to plan and execute the 2019 Relay for Life. The Fundraising Tools will be unaffected. However, the transitional period does mean that the planned ACS / RFL Community Gateway project has been put on hold, as has the 5-Days of Relay. There will doubtless be further updates on all of this via the SL Relay Info website, and I’ll obviously aim to try to keep abreast of the news and report it here. In the meantime, I’d like to take a belated opportunity to thank Stingray, someone I’ve only recently come to know, more’s the pity, for all of his work over the last nine years and for his enthusiasm for Second Life and its community; in particular, I’d like to publicly acknowledge his support and encouragement when I was having to face the threat of cancer myself at the start of 2018. For those wishing to give further end-of-year support for RFL of SL fund-raising work, then as noted above, the SciFi Mini Expo is currently underway, and is being hosted on the ground level at Solaris Space Station, a Second life Role-Play Community. The event will run through until Sunday, December 23rd, 2018. The setting has a suitably wintry feel to it, but overall, details are a little scant. You can check the event calendar for entertainment at the Expo (ignore the title of the calendar – it does in fact refer to 2018! ), but the best way to see what is available is obviously to pay a visit. There is a fair selection of booths for role-play groups etc, plus a ski / sled run is available, alongside of a zipline ride, while ice skating can be found down on the ground.. The theatre is nicely arranged as the bridge of the original Enterprise NCC-1701 (with additional seating) – although the advertised film showings were at the time of my visit (and not a little amusingly) for The Orville. Alongside the Expo region is a second (reached via the maglev style car circling both regions) is a broader events area. Not specifically Expo themed, it does have RFL kiosks scattered around it, and offers various activities. These include a Warbugs air combat airstrip with ‘plane rezzer and – for those wishing to keep in the sci-fi spirit, a starship rezzer specifically for the Expo, offering a choice of classic Star Trek Constitution class cruiser or snazzy classic Klingon D7. I confess, I found flying these around a lot of fun 🙂 . Should you opt for the latter, please consider a donation to RFL of SL at the nearby kiosk. The annual RFL Christmas Expo opened its gates on November 30th, 2018, and will run through until December 9th. Located on six regions adjoining the American Cancer Society’s in-world headquarters, this year’s expo offers a wide range of shopping opportunities, entertainments and a raffle with a L$76,000 first prize. Over 120 merchants from all fields are participating in this year’s event, and you can find direct teleports to all of their stores within the regions in the Expo shopping guide. The schedule of entertainment provides a day-by-day breakdown of all the live entertainers, DJs and dance performances. which include live performers and DJs, all of which culminates in the Holidays of Hope Gala Ball. Now in its ninth year, the theme for the Gala Ball is Sounds Of The Season. Sponsored by T1 Radio, the gala will take place in a stunning Christmas music box complete with a dancing ballerina, created by Melodie Jigsaw. Featured performers will be Satin & Erin, Madelyn Majestic and Trader Whiplash. Admittance is free, and participants will be able to purchase Holiday Gift Basket Raffle tickets with all proceeds going to the American Cancer Society. The ball will take place from 13:00 through 18:00 SLT on Sunday, December 9th, 2018, and holiday formal attire is requested. The Holiday Shopping Spree Raffle: several Expo merchants graciously donated to the Holiday Shopping Spree Raffle. One lucky winner will walk away with over L$76,000 in gift certificates and prizes! Tickets are L$250 each and the draw will be held on Sunday, December 9th, 2018 at 19:00 SLT at the Holly Jolly Cafe. Lights of Hope: this year, a number of Second Life’s home builders have decorated the outside of one of their houses in holiday style and brought it to the Expo. Stroll the Holiday Road neighbourhood at the Expo and vote for your favourites by donation to the Relay For Life kiosk in front of each home! 100% of all “votes” goes directly to the American Cancer Society. In addition, some of the builders have offered their homes for sale in a Relay For Life Christmas Expo vendor at the Expo’s Real Estate Office in the neighbourhood. By taking part in these events, and the Expo as a whole, Second Life users can help fund two positions in the Kenyatta National Hospital Patient Navigator Programme. You can also read more about RFL of SL support for the Kenyatta National Hospital at Fantasy Faire 2018: supporting the KNH Hope Hostel. And don’t forget the Holiday Stocking Stuffers and the Expo Gotyas, while bloggers might enjoy the challenges being run in association with the Expo. Full details of the entire Christmas Expo can be found on the official website. Some 1.7 million women – and men – were diagnosed with breast cancer in 2012, the most recent year for which detailed statistics are available. It is currently believed that the figure remains around the 1.6 million mark world-wide, which equates to around 270,000 new cases of invasive breast cancer per year in the United States and around 55,000 in the UK alone. Making Strides Against Breast Cancer is a signature event by the American Cancer Society to raise awareness of, and funds to counter / treat breast cancer, and it is marked in Second Life very October with the Making Strides Against Breast Cancer (MSABC) Across Second Life event. For 2018, MSABC Across Second Life will be holding an expanded season of events through October, a couple of which I’ve previously blogged about, and on which ACS and the MSABC team issued more information on Friday, September 7th, 2018. In all five events are planned for the month, offering a broad range of options by which Second Life users can donate money that will expressly go into the work involved in treating and researching breast cancer and its causes. Full details of the events can be found on the MSABC Across Second Life website, and I’ve summarised the key points below. Dates: now through until Sunday, September 30th, 2018. Photographers across Second Life are invited to share their artistic talents by submitting a photo that they feel best reflects the Photos For A Cure theme to the MSABC Across Second Life Flickr group. A prize pool of L$22,500 is available for the photos judged as best reflecting the theme. 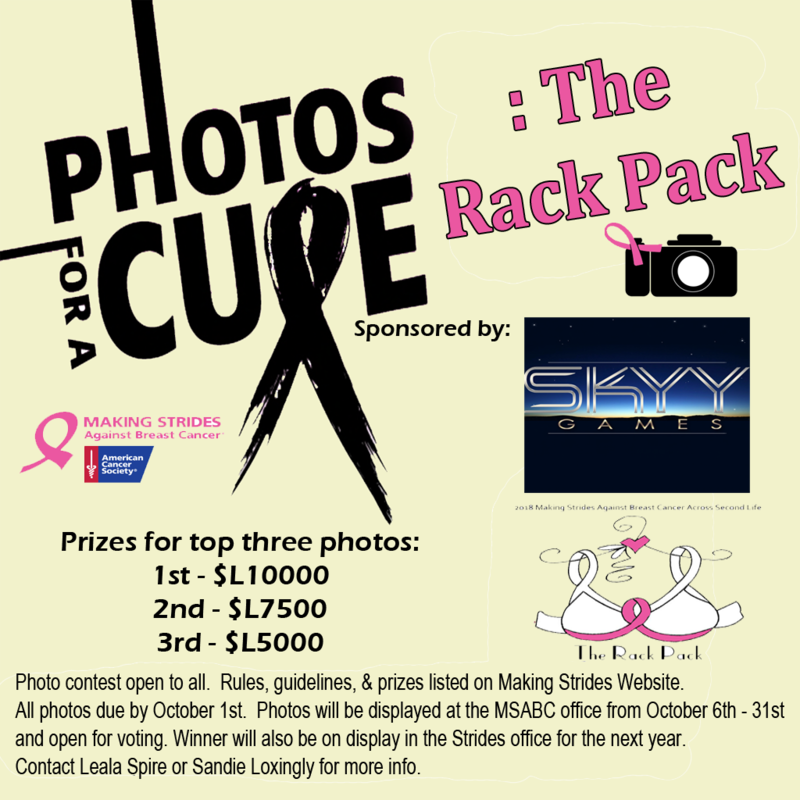 For contest rules and details, visit the Photos For A Cure on the Making Strides website. Dates: Monday, October 1st through Wednesday October 31st, 2018. SLurl: all across the grid – HUD based. Get your shopping HUD at the American Cancer Society Island, then visit the variety of stores who have committed to Making Strides Against Breast Cancer. The more you buy, the greater the funds raised for MSABC. Collect a Parade of Homes HUD from the American Cancer Society Island and use it to hop to the participating designs and discover your dream home for Second Life. This is a perfect opportunity to discover some of the great home designers in Second Life, get your new home, and fight breast cancer – all at the same time. The parade of homes will conclude with a special live auction for a L$90,000 dream home, donated by Slash Hansome, owner of AXL pro – check the MSABC website for details in October! Date: Saturday, October 20th, 2018. Registration opens: Saturday, September 15th, 2018 (walkers); Sunday, September 16th, 2018 (sponsors). SLurl: check the MSABC Across SL website. Get your walking shoes ready and join other walkers at the 2018 Strides Walk track. The Walk-a-Thon will take place between 10:00 to 18:00, with walkers invited to join in throughout for as long as they can. Music will be provided throughout the event, and there will likely be an after-walk party. Walkers will be provided with tools to track the number of laps they complete around the track, allowing them to collect pledges from their supporters. Awards will be presented for Top fund-raiser, most laps completed, most sponsors (pledges), and Overall Top Walker. Registrations, once open, will be available through the MSABC Across SL website. Date: Saturday, October 27th, 2018. In 2017, the Making Strides campaign raised over US $10,000 for the American Cancer Society. For 2018, the MSABC team would like to beat that total – so why not be a part of the efforts by taking part in one or more of these events throughout October? The American Cancer Society (ACS) has a long and distinguished history of fund-raising to help those with cancer, their families and their caregivers not only in the United States but the world over. ACS is perhaps most widely recognised for the Second Life Relay for Life season with its mainstream events: the kick-off weekend, the main weekend, and the mega events such as Fantasy Faire, Making Strides Against Breast Cancer, the Science Fiction convention and so on. This 2018 in-world season for ACS has been one marked by a number of changes, all of represent the first step in a multi-phase plan to shape the future of the American Cancer Society in Second Life and in virtual spaces beyond. For example, for 2018, Making Strides Against Breast Cancer (MSABC) is launching a new approach to breast cancer fund-raising in Second Life,with not one, but two month-long events running throughout the month of October: the Parade of Homes, and the Out-Shop Cancer event. In addition, MSABC will also host the “5K” walk, where walkers can collect donation pledges for the amount of laps walked around a pink-ribbon track. Also, earlier in 2018, the Fantasy Faire team raised over US $50,000 to help with the Kenyatta Hospital Hope Hostel project in Kenya (see: Fantasy Faire 2018: supporting the KNH Hope Hostel). Going forward, ACS plan to allow volunteers and fun-raisers to have more opportunities to directly affect specific global projects, while additional focus will be placed on establishing new partnerships with businesses both in and out of Second Life, helping the ACS volunteers communities grow and increasing outreach efforts to let cancer patients, survivors, and caregivers know that they have a place to turn for support, without having to leave Second Life. As a part of this planning, ACS is refocusing its in-world efforts, to both enhance existing activities and events and to offer a new range of opportunities and programmes in world to assistance and support to anyone facing cancer either directly or as a caregiver or family / friends. In addition, ACS is asking all of those who have supported their work as a volunteer, or who wishes to join the ranks of ACS volunteers to take a moment to find out more about the restructuring and refocusing (see below), and complete the ACS in SL Volunteer Form. Support, Outreach, Advocacy Team: providing overall vision and strategic guidance for the American Cancer Society in Second Life, including developing and executing outreach strategy for recruitment of new volunteers, new partnerships, new relationships, events, etc. Also advocates on behalf of all teams within the ACS volunteer structure. Partnerships: working with volunteers to meet & discuss partnership opportunities for all areas within the ACS in Second Life. Provides strategic consulting and fundraising coaching to volunteers in Second Life. Research: investigating ways to help identify opportunities for all areas within the ACS in Second Life. Mega Events: consulting with the RFL mega events teams, identifying potential events, and fostering growth, when appropriate. Media: establishing and maintain relationships with media partners, providing back and forth communication of needs, assets, and expectations. RFL Season Lead: coordinating tasks associated with the execution of the RFL of SL season, from pre-kickoff until event weekend. RFL Event Lead: coordinating the tasks associated with the execution of the RFL of SL event weekend. ACS Island Design: establishing ACS island as a destination experience that features the services offered by the ACS in Second Life. ACS Island Event: managing the calendar of events for ACS Island; booking performances, recruiting merchants for stores, and promoting ACS island events to the grid. Hope Haven Survivor Group: fulfilling the new vision for Hope Haven Survivor Support, working with ACS team to promote Survivor Support Group to the grid as a place for cancer patients and survivors to receive support from one another. Hope Haven Caregiver Group: fulfilling the new vision for Hope Haven Caregiver group, working with ACS team to promote Caregiver group to the grid as a place for education and information for caregivers. Also produces interactive experiences that educates residents on cancer information and support. 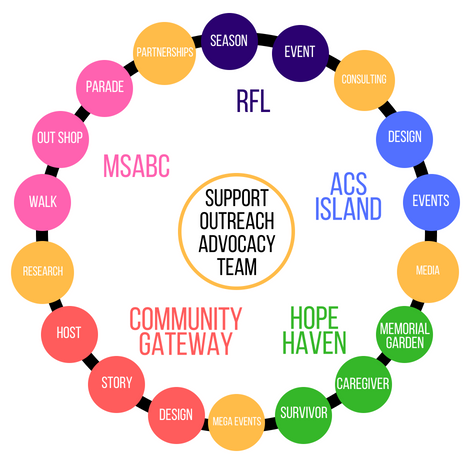 Hope Haven Memorial Garden: managing the memorial garden experience on the American Cancer Society island. Community Gateway Story: developing and writing the story that will be used to teach/train new users in Second Life on how to use the platform. Community Gateway Design: coordinating the design tasks in order to build the Community Gateway learning environment, as defined by the story. Community Gateway Host: leading and coordinating the hosting tasks for the Community Gateway, ensuring that new users are welcomed, supported, encouraged, and have a friend along their journey. Also provides recommendations for groups and communities to join, as well as offering ACS volunteer opportunities, when appropriate. MSABC 5K Walk: coordinating the tasks related to the MSABC 5K walk event in Second Life. Parade of Homes: coordinating the tasks related to the annual Parade of Homes breast cancer event in Second Life. Out Shop Cancer: coordinating the tasks related to the Out-Shop Cancer breast cancer event in Second Life. It is Stingray Raymaker’s hope that by initiating and growing the new events and activities within this list while continue to grow and enhance the existing range of events fostered by Relay for Life in Second Life, the American Cancer Society will be seen as the premier destination experience for cancer patients, survivors, caregivers, and their families and friends worldwide. A place where they can find support, answers, education, and resources to help one another and anyone facing cancer wherever they are in the world and on the grid. via Stingray Raymaker and the RFL of SL website.